In 1940, the Polish Red Cross (PRC), based in the unoccupied area of France, was commissioned by the Polish government in exile to help the Poles stay in France. It therefore had to deal with the problem of schooling for young Poles and took part in the discussions that led to the creation of the Polish High School in Villard. The PRC hired the staff required, paid the rent for the school buildings and made them available to the Service de Contrôle Social des Étrangers, or SCSE (Department of Social Management of Foreigners). The Hôtel du Parc et du Château, standing in the centre of the village just a stone's throw away from the Town Hall, officially became the SCSE's Centre no. 56b. It was initially given the status of a hostel for Polish refugees, but was soon made a secondary education establishment. The Hotel consists of two buildings. The oldest of these - the Château - was built circa 1760 by Antoine Esbrard de la Vallonne, a noble married to Françoise Lambert, the daughter of one of Villard's public notaries. During the summer months, they would invite their friends to this huge and sumptuous mansion and its two-hectare estate. In the nineteenth century, the mansion became the property of Mr Jullien, a public notary who would also be Mayor of Villard one day, and was then bought by the Bertrand family, who named it the Château. In the twentieth century, the Château was bought by the Beaudoing family, who had a new wing added on and converted it into a hotel. By 1940, the two buildings had been renamed the Hôtel du Parc et du Château and now belonged to the Guichard family. Very soon, the school needed more room than was available in the Hôtel du Parc et du Chateau. 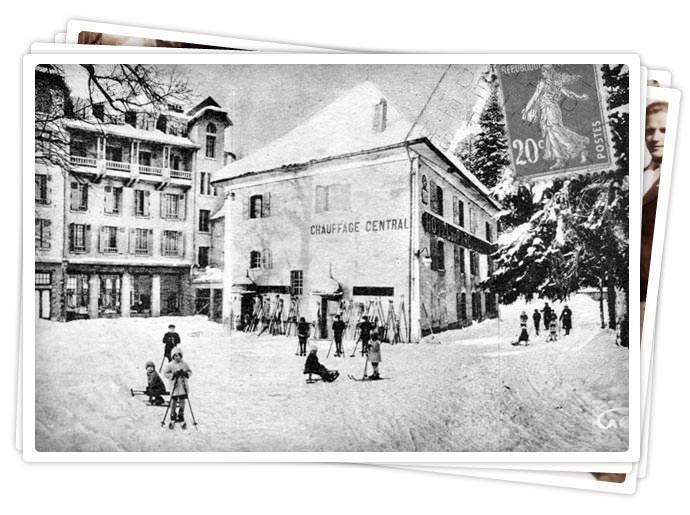 Back in those days, Villard-de-Lans was already a popular winter sports and health resort. It had a great many hotels and boarding houses, which since the start of the war had been left very empty, but there was no reason why they could not be used for other purposes. Consequently, a number of them were turned into dormitories and classrooms, firstly the hotels (Hôtel de la Poste, Hôtel des Loisirs (currently the Hôtel du Centre), Hôtel Fleur des Alpes and Hôtel Beau Site), and then the children's holiday centres (Le Rocher and Stella Matutina), which were used to accommodate the youngest children. From the educational point of view, the Polish High School was regulated by the French Secretary of State for Education. In practice, it was dealt with by the Grenoble Education Authority. Bernard Hamel, a French language assistant in Krakow until 1939, was asked by the University Chancellor to oversee the teaching given at the school. The school's administrative staff were legally answerable to both the French and Polish authorities. They managed its premises, budget, staff, accommodation conditions, food, lessons and boarding facilities. In September 1941, the French government began to fear that the Polish Red Cross in France might fall into the clutches of the PRC in Warsaw, which to all extents and purposes was controlled by the Germans. Consequently, it decided to set up the Groupement d'Assistance aux Polonais en France (GAPF), a body intended to provide assistance to Poles living in France, with Zygmunt Lubicz-Zaleski at its head. Supervision of the high school was transferred from the PRC to the GAPF. The Polish government was by this time in exile in London. It considered the high school in Villard-de-Lans to be a State education establishment, and continued to support it with funds sent more often than not via Switzerland, regardless of whether the PRC or GAPF was in control. The Poles working for the GAPF valued this kind of financial independence. They refused to accept any kind of allowance from the French authorities for certain centres such as Villard, “so as to avoid any outside interference in the area of youth education”. This decision proved to be unrealistic once German and Italian troops moved into the “zone libre” in November 1942. Now that the area was occupied, contacts with London and Switzerland became very difficult and the GAPF also realised that dependence on the French authorities could also serve as an umbrella protecting it from action by the occupier. Vichy therefore took the Cyprian Norwid High School under its wings and from then on, it depended on the SCSE.